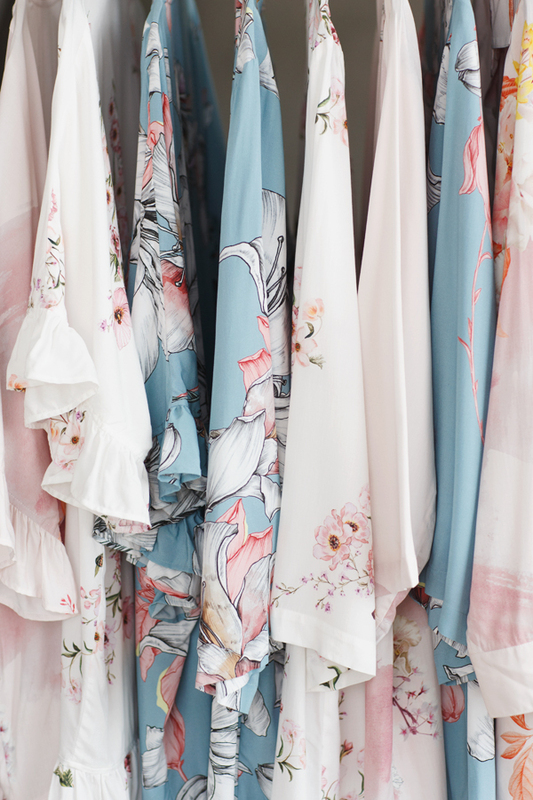 In an effort to provide support and raise awareness to victims of domestic abuse, we will be gifting a floral robe for each and every order placed between February1 and February 14, 2019 to women affected by relationship abuse. We're supporting, Knock Out Abuse West and Haven Hills Women’s Shelter and hope to gift as many women in need as possible. Q: Tell us what motivated you assist women affected by relationship abuse and domestic violence? A: It’s both a purpose and issue close to my heart that can shatter lives and families. I’d like to help affected women build back their lives – and their confidence as always create awareness to stop the abuse cycle into the future. Q: What inspired this giveback program? One kimono robe for every order placed? A: We’re working against several layers of programming to help abused women in need. The Valentine’s Day giveback just felt right. It’s not a solution to this issue but we hope a pretty floral robe brings a small joy to women who likely haven’t experienced kindness or value in a long time. Q: As brand in the wedding business, what does this platform mean to Plum Pretty Sugar? A: The wedding industry is comprised of many smart and talented women and men who have a platform to create awareness for the issue. Understanding the cycle, working to prevent it and helping to build back lives is important. Plum Pretty Sugar was also borne out of this issue. I created it to build back my own life and my own story as a victim of abuse. 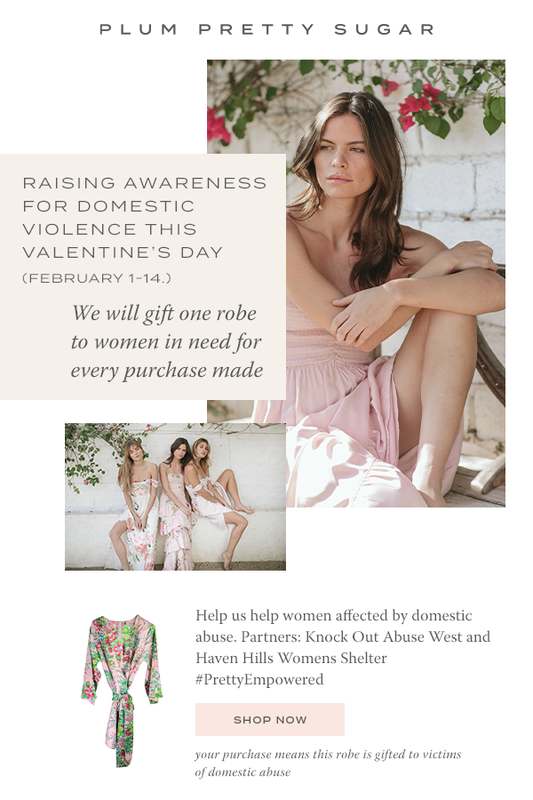 Be sure you purchase your bridesmaid dresses, bridal party robes, bride to be robes and bridesmaidpajamas between Feb 1 and Feb 14 and giveback to women in need! To raise awareness and provide support to victims of domestic violence, a cause aligned closely with the personal story of Founder and CEO, Charlotte Hale. Plum Pretty Sugar is committed to developing a range of programs and practices to assist individuals affected by relationship abuse. Anti-domestic abuse partners, Knock Out Abuse West and Haven Hills Women’s Shelter. Knock Out Abuse West is a non-profit organization based in Los Angeles that raises awareness and funds for victims of domestic abuse. Haven Hills provides safety, shelter, and support to victims of domestic violence while leading efforts to prevent the cycle of abuse for victims and their children. For every order placed at www.PlumPrettySugar.com, between February 1 and February 14, Plum Pretty Sugar will provide a floral kimono robe to our anti-domestic abuse partners, Knock Out Abuse West/Haven Hills. The goal is to gift as many as possible. 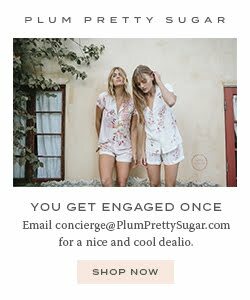 For more Plum Pretty Sugar’s initiatives, here. For more about Plum Pretty Sugar’s female founder, Charlotte Hale here.